A brand new teaching folder created specifically for the new Edexcel 2016 specification. 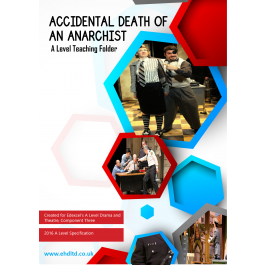 If you're teaching Accidental Death of an Anarchist for Edxecel's Component 3, this folder's for you! This teaching folder will provide you with a wealth of teaching ideas and resources to teach the entire play, from both a practical and theory-based perspective. Whether you want to dip in out of the folder, or follow it as a complete scheme, this will save you hours of planning. All teaching ideas and resources focus upon how designers and performers can use theatrical conventions to realise ideas from the page to the stage. The folder will provide you with a comprehensive range of resources to help students to respond to an unseen extract from the play, in preparation for their exam. The teaching ideas and resources focus upon a broad range of performance and design perspectives and allow you teach students about topics such as: Fo's political intentions, political farce, the Commedia dell'arte and the influences of this for a performer and designer, meta theatre, stock characters, political satire, the actor/audience relationship through characters such as the Maniac, using gestural space to establish a close audience relationship, characterisation and functions of the key roles, non-verbal performance ideas, performing themes such as disguises, the significance of props such as the bomb or the window, the use of dual ending and many, many more. Students will be able to apply this theory to their unseen extracts when discussing the play from a performance or design perspective.